Exclusive use of the property, large villa with pool and garden, WiFi, privacy. Villa Carmignani sits in the Chianti Classico hills among olive groves and cypress trees, just 20 km from Florence. Enjoy beautiful views and a private pool nestled among the vineyards. Our Villa sleeps 10 people, with 5 bedrooms with AC and 4 bathrooms. The villa is full of authentic touches, such as frescoed ceilings, and original wooden beam ceilings and terracotta floors. Enjoy your meals outside on our shaded patio just outside the kitchen, and relax by the pool or in one of our comfortable, elegant living rooms. Unlimited internet WiFi available, plenty of outdoor areas and absolute privacy. Great location for exploring Tuscany: easy day-trips to Siena, Florence, Lucca, San Gimignano, Pisa and of course the Chianti Classico region with its famous wineries. The town of San Casciano Val di Pesa is 4 km away from the villa: there is a good quality supermarket (also open on Sunday morning), pharmacy, gas station, restaurants and shops of all kind. On Monday morning there is a weekly market in town. San Casciano is a lively, hilltop town: all year long locals meet in the historic centre locals to chat and have a coffee, do their everyday shopping at the charming small stores, and children stop for a gelato on the walk home from school. Here you can have a taste of authentic Tuscan life side by side with people who live in the town year round, instead of a tourist trap. My family has an olive oil mill, just down the road from the villa. From the moment that we started communicating with Sabrina in order to find out about this beautiful villa, until the moment that we drove away the experience was great! Sabrina is very prompt with her responses which makes communicating a breeze. I even asked if she knew of a private chef that would come in and cook for our family one evening and she helped me with that as well. Turning into the driveway, through the gate and past the olive groves on either side was breathtaking and thrilling. The property is so pretty and well maintained. The air conditioning in the bedrooms worked perfectly and we all slept comfortably after days of sightseeing and swimming in the beautiful private pool. The villa sits on a hill and we spent memorable/comfortable evenings gathered as a family under a lovely shade tree talking and looking out at a "typical breathtaking Tuscan view" of hills and vineyards and olive groves. The breeze was gentle and made even the 90 degree days feel comfortable and relaxing. I would return again and hope to one day. Thank you Kim, it was such a pleasure to have you here! Staying at Villa Carmignani was one of the best parts of our trip to Tuscany. It was just far enough outside San Casciano to feel like we were in the country, but still close enough to run into town easily. The views all around were astonishing. It really looked like a postcard. The house itself was in great condition, nicely upgraded wherever needed, but still retaining all the old touches. One thing that might help to understand, is there are actually 6 bedrooms. But one is in between two others, so it doesn't have its own separate entrance. But there is also a tower bedroom, which was pretty cool too. There are 4 full bathrooms as well, 3 of which are en suite. There is a powder room downstairs too. It is worth mentioning that the bedrooms have screens on the windows (except the tower), and there are fans in each room. So nice to keep the mosquitos out! The wifi was really good, which is pretty unusual in Europe based on our travels. The kitchen was nicely equipped with plenty of dishes and lots of cooking stuff. Plus an American coffee maker, which we appreciated. You will need to bring or buy all supplies, including salt, pepper, sugar, etc. There is so much room in this house to spread out with a big group. We ate breakfast at the outdoor table in the morning, had happy hour under the big oak tree, and ate dinner in the room with the fireplace. It was chilly, but Sabrina was nice enough to bring us some firewood and we built a cozy fire each night. It was too chilly to spend time in the pool, but I can see it being great for hot summer days. One night we had two ladies, Lina and Moira, from ChefInTuscany.com (Sabrina's recommendation), come over and cook an amazing dinner for us. That was definitely a highlight! Sabrina was so great to work with right from the start. She responded quickly to all of our inquiries beforehand, as well as while we were there. We got to meet her mother, daughter and father too! They gave us two bottles of their wine, Lunatico, which is made right below the house, and we loved it so much we bought two cases which we drank over the 10 days we were there. 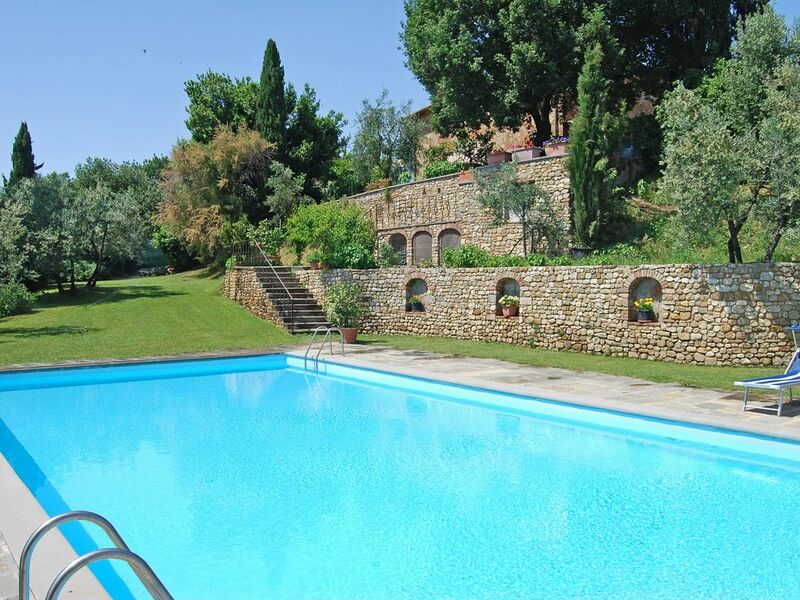 I really recommend this villa if you are looking for the quintessential Tuscan country villa. We would love to return if we have a chance in the future. We were thrilled to read your comments, thank you very much for taking the time to write such a thorough review. It is extremely rewarding for us that our guests have a good holiday, we really hope to have you here again in the future. The service was extremely good and we also had the pleasure of using cheftuscany.com to come to the house and prepare and serve a tuscan menu one night. Thank you for your comments, we look forward to having you here again in the future! Die Villa Carmignani ist ein Traum. Altes, perfekt restauriertes Landhaus inmitten von Weinbergen und Olivenhainen im Chianti Classico-Gebiet. Große geschmackvoll eingerichtete Zimmer. Und ein riesiger Pool. Das perfekte Ferienhaus! Die Vermieter sind äußerst freundlich und hilfsbereit. Wir (2 Familien mit insgesamt 5 Kindern) haben unseren Urlaub sehr genossen. Thank you for your comments, it was a real pleasure to have you here, we'd love to see you here again! The property was well maintained and very clean and in good condition, including the pool. The property is not air conditioned but there are fans for your use. Be sure to bring your own hair dryer. They have provided an electric American-style coffee pot, you have to be creative with finding coffee filters, or bring your own. There is a very convenient grocery store in town where you can get anything you might need or want for your stay. The owners were very friendly and had a handyman available to address any issues or concerns. The grounds are beautiful, we spent every morning and evening relaxing while looking out over the vineyards and olive trees. We wanted to stay another week--We will return someday! The perfect Tuscan retreat! Thank you for your beautiful review and most of all thank you for giving us the input (upon your departure) about writing the history of the house. We are happy when our guests enjoy the villa and we’ll be even more happy when they are aware of the history of the house, which is the history of the Tuscan countryside. I am sorry about the hairdryer, in the future we will provide them to our guests, along with some names of coffee brands for the American style coffee pot so it will be easy to spot them at the supermarket. You are always welcome at our villa, we hope to have you back here soon! Une maison de rêve ! Superbe maison idéalement placée pour découvrir la Toscane. La villa est en tous points conforme aux photos et même la piscine est effectivement immense ! L'ensemble est de grande qualité et décorée et meublée avec goût. Thank you very much for sharing your comments about the villa, we are very happy to read your words. We look forward to having you back here in Tuscany, you are always welcome! Our location offers the tranquility and quiet of the countryside, and convenient distance to Florence at the same time. We are easily reached by Florence and Pisa airports. Perfect location for exploring the wineries of Chianti and Tuscany's most beautiful towns and cities. San Casciano Val di Pesa, the nearest town, is just 4 km away. A quiet hilltop town, it offers all amenities, delicious restaurants, easy parking and convenient, frequent bus service to Florence. Discover an authentic village, away from the tourist traps! Refundable safety deposit due in cash at arrival: € 500 Final cleaning to be paid at the of your stay: € 100 Electricity: € 100 per week Air conditioning: upon consumption € 0,35 per kw Gas on consumption.